NEW YORK - Haitian-born Bernedy Prosper and his son Harold have called the United States for more than a decade now, but deportation is now staring them in the face. A broken Prosper, 52, laments that this is worst thing possible, even suggesting that death awaits his 23-year-old son if they are forced to return to the homeland they fled in search of a better life. Harold is one of more than 4 000 Haitians awaiting deportation after former US President Barack Obama decided last year that Haitians no longer qualified for Temporary Protection Status (TPS) which is reserved for victims of natural disasters. The status was granted in 2010 following the catastrophic 7.0 earthquake. But now their fate is in the hands of President Donald Trump, who has vowed to deport millions of immigrants. “I believe that if he is put back to Haiti, I have no more son. I know they will kill him,” Bernedy told the Associated Press. The TPS will remain in effect until July, and documented Haitians who are already protected do not risk deportation. 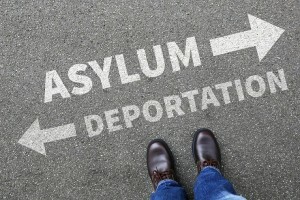 But since October, more than 1 600 other Haitians have been deported. Bernedy was granted political asylum after arriving in Florida back in 2000 without immigration documents. Harold was caught trying to cross the Mexican border and remains detained in San Diego, California. Steve Forester, who works for the non-profit institute for Justice and Democracy in Haiti, says they are being bombarded with appeals for help. “We get desperate phone calls from people. Unfortunately, there’s nothing we can do,” he told the Associated Press, insisting that deportation to a country still struggling to recover from the recent passage of Hurricane Matthew compounded by the slow recovery from the 2010 earthquake is inhumane. Forester, though skeptical that the situation will change, remains hopeful that immigrants like Bernedy and Harold will be spared.